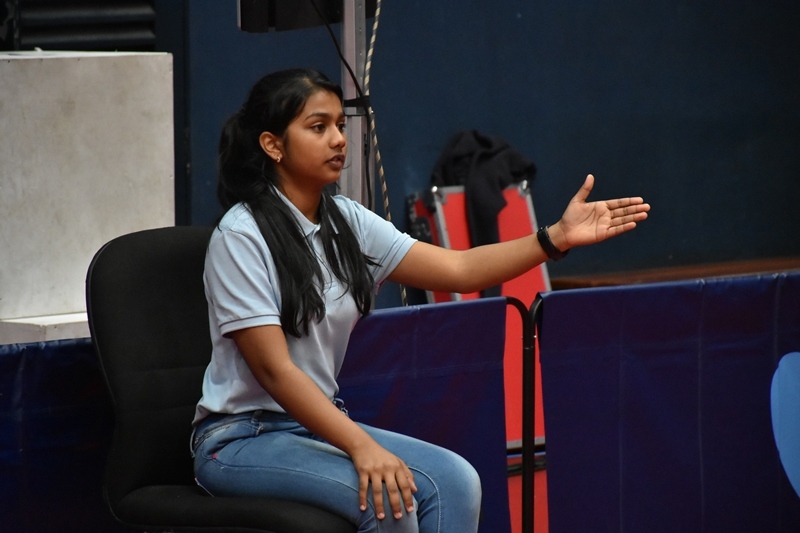 At 16, Sadoolah Zaynah is having one of the best times of her life at the 2018 ITTF African Championships holding in Mauritius. She is not taking part in the team event for Mauritius but she is a good ambassador as one of the umpires handling proceedings at the African showpiece. Always excited to go on table and in a rare chance for the grade 11 student of SSS Ebene Girls, she was assigned to handle the semifinal tie between Nigeria and Algeria and she was opportuned to watch her idol – Aruna Quadri (NGR) live. “I was so happy that in the last three days I cannot hide my feeling particularly handling match involving Africa’s best player – Aruna Quadri (NGR). I was so happy that not many people had the chance to watch Aruna plays live but for me I handled the match and I enjoyed every moment I spent on centre court,” she admitted. Despite not formally trained for the task, Sadoolah Zaynah believes her interest in umpiring has grown. “Few days to the competition, I was told as volunteer that I will be one of the umpires that will handle proceedings in the competition. Initially I was bit nervous particularly on the first day. But as the tournament progresses I gained confidence and I started falling in love with the work,” she said. Unable to hide her excitement handling Aruna Quadri’s match, she said: “I was a bit nervous when I realized I will be in charge of the match involving Aruna Quadri. I never had the opportunity to watch him play live matches. But as an umpire, I was given that chance and when I got into the centre court I was initially under pressure but when the match started I gained my confidence. But there was a scenario in the match, when Aruna won a very crucial point, I wanted to show my excitement but I realized I was an umpire. So I quickly conduct myself. I cannot forget every moment of the match because it will remain with me forever. Aruna was such a good player because I can never imagined how sometimes he managed to return some balls to the table. His topspin forehand is unique and I cherished every point he won and I hope I can get more chance like this to be in charge of his matches,” she enthused.